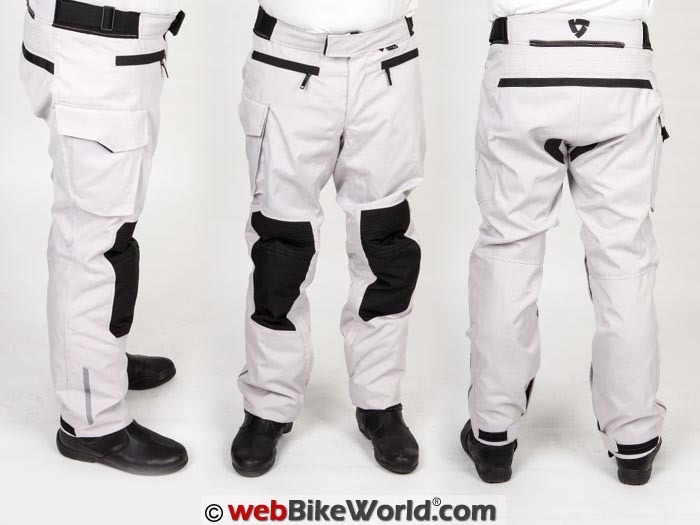 The Enterprise 2 pants are a good choice for cool and inclement weather motorcycle riding. There are many changes in this second version of the Enterprise pants that separate it from the original not only in design but in the materials used. The Enterprise 2 pants are a very good follow-up to an already popular choice from REV’IT! Earlier this year, Brandon and I reviewed the Outback 2 jacket from REV’IT!. At the time we wanted to put together a complete package with some matching pants. I also wanted to make sure I had protective riding pants that would mate to the provided connection zipper on the jacket. In fact, REV’IT! 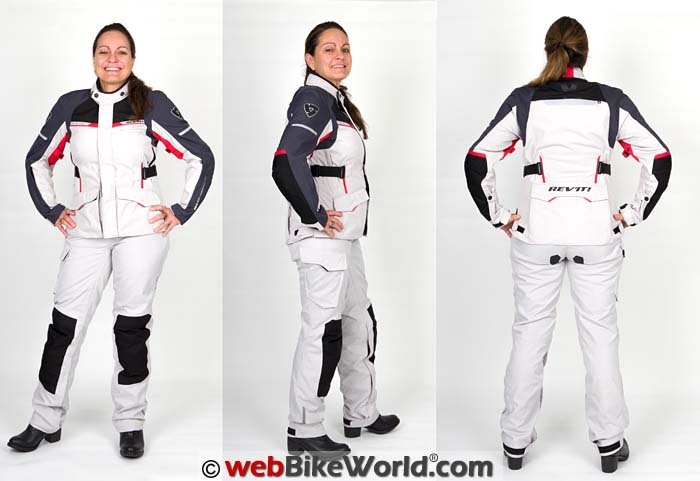 recommends the Enterprise 2 pants as a good match for the Women’s Outback 2 jacket, although I discovered that there is an Enterprise jacket (still at version 1), which does have styling similar to the Outback 2. The basic sport/adventure shape for both jackets is where the similarities end, however, and the extra $90.00 for the Outback 2 makes it worth it to me. The Enterprise 2 pants are at the lower range of REV’IT! pricing for riding pants at just $199.99, only a penny south of the $200.00 mark. At this price point, you would think that something has to give and where exactly that happens and what feature might be left out is a meaningful discussion for everyone, but also very subjective. REV’IT! has updated the original Enterprise pants with this new Enterprise version 2 and the changes are significant. To start with, the original Enterprise pants had a full-length leg zipper that ran on the inside of the legs. This of course made it easy to put the pants on or take them off while still wearing your footwear. 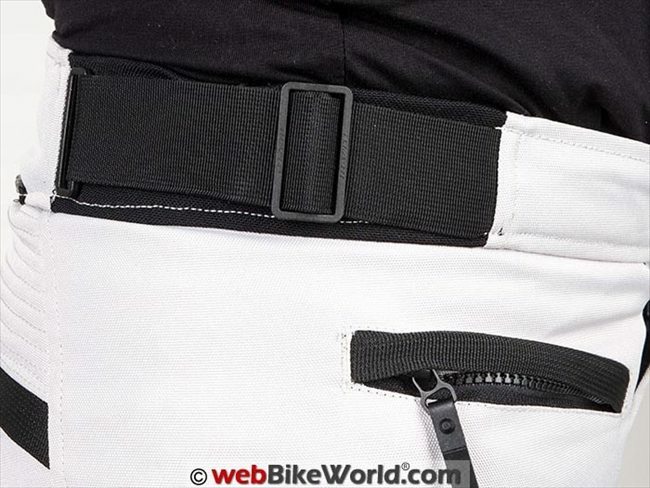 The Enterprise 2 pants instead offers a gusset-backed zipper that runs from below the knee down to the leg opening. This makes it easier to put the boots on and fasten them, but the opening isn’t large enough to slip booted feet through the legs. This isn’t necessarily a bad thing though, because one of the reasons for the change is that the shell is no longer the waterproof layer. The Enterprise 2 pants use a waterproof breathable liner that is permanently attached to the inside. This makes the long zippered leg of the original Enterprise pants impractical, as it would compromise the water resistance of the garment. Maybe issues with waterproofing could be the reason for this change from the previous version? As in our Outback 2 jacket review, I will also note differences between the women’s and men’s version. Don’t expect a lot, however, because the differences between the men’s and women’s versions of the Enterprise 2 pants are not as apparant as they were in the jackets. .
Brandon and I both opted for the silver colorway for the Enterprise 2 pants, but honestly, I would call them white instead, because I think of something a little more grey-ish when I think of a silver textile color. But, this color is indeed bright and that makes it more visible for safety’s sake. 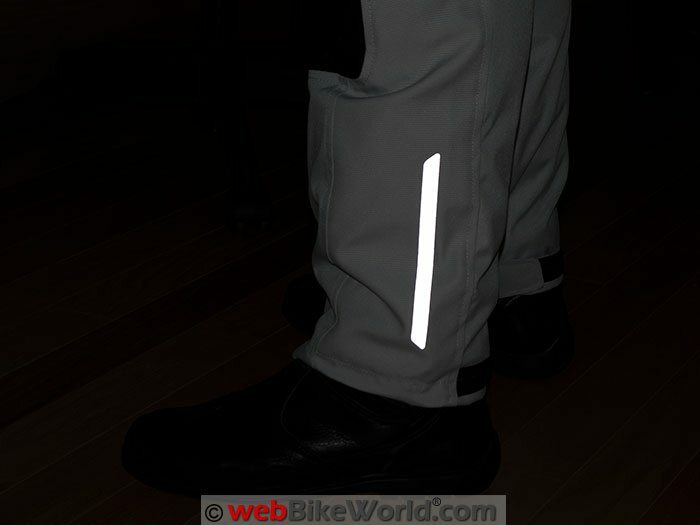 This is good thing, as the only reflective material present includes two strips above the ankles on the outside facing side of the lower legs. The pants close at the waist using a zipper and a slide-snap type of fastener. This design uses a triangular open wedge that slips over and around a thick channeled button. 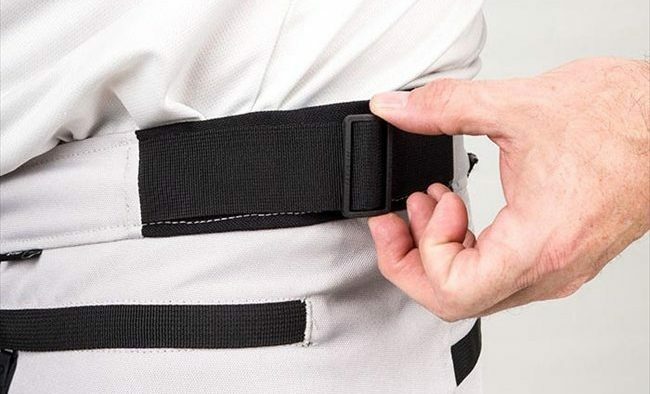 The result is a fastener that won’t come undone accidentally and yet is fairly easy to fasten and open, a very good design feature that was implemented for both the women’s and men’s versions of the Enterprise 2 pants. The Enterprise 2 pants offer storage with two pockets up front at the waist and one on the right thigh. Men’s version, thigh pocket on right leg. Men’s version, hip pocket with zipper. The waist pockets are 6 inches wide (15.25 cm) and also the same distance deep. The openings are narrow and they close with a zipper. 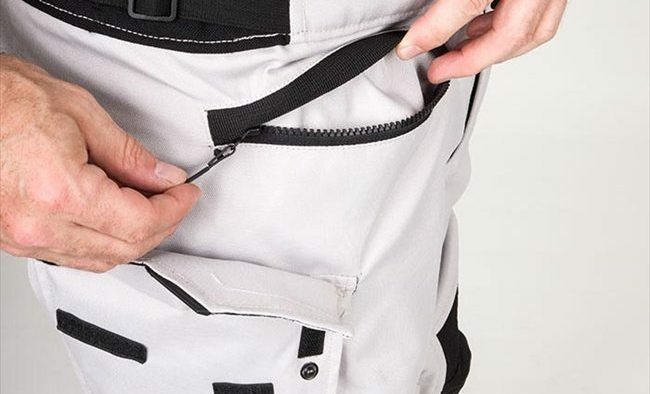 Getting your hand in the pockets can be a bit of a tight fit and the zipper can rub the top of your hand when reaching in, at least on the women’s pants. On the men’s pair, the same pockets are 7 inches wide (17.75 cm) and 7 inches deep which gives a bit more room. Men’s pants don’t tend to fit as close to the body, so I guess it is possible to make more use of the pockets. Brandon found the same problem as I did with the zipper teeth being abrasive, however. The thigh pocket is useful for items such as a cell phone, wallet, and similar items and is closed with snaps and hook-and-loop fasteners. The thigh pocket is easy enough to reach and access and the placement is on the side of the leg in a good position when standing up. 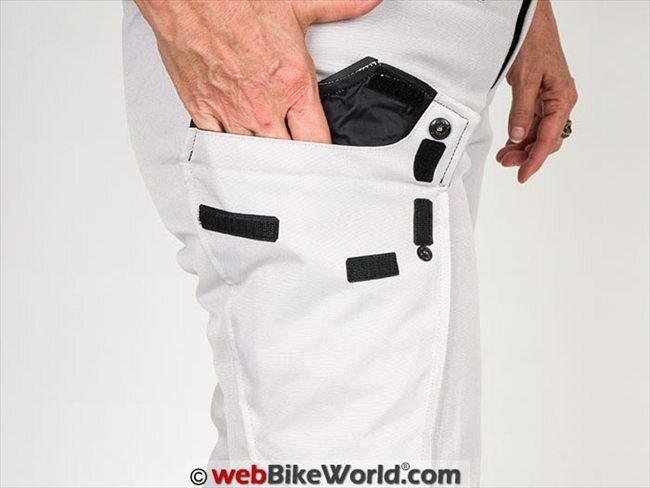 This pocket also appears to be lined with the same Hydratex material as the waterproof interior of the pants. REV’IT! doesn’t mention specifically that this pocket is waterproof but the material feels exactly the same as the liner. Brandon pointed out that he didn’t think the right leg was the best place for this pocket. His thought is that if you’re riding and needed to access the pocket, using the left hand is easier. My take is that perhaps REV’IT! 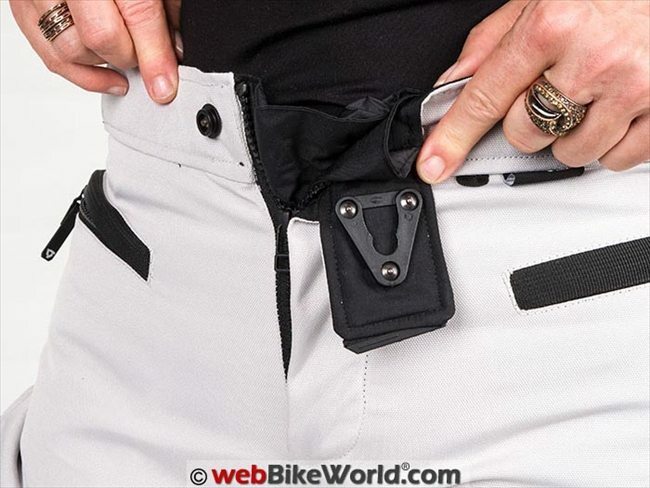 wants to discourage riders from reaching in their pockets while on the move and not let go of the throttle? There is a short connection zipper for attaching to REV’IT! jackets on the back of the pants. Below the attachment point is a section of accordion style material, although it looks like it would stretch but it doesn’t. 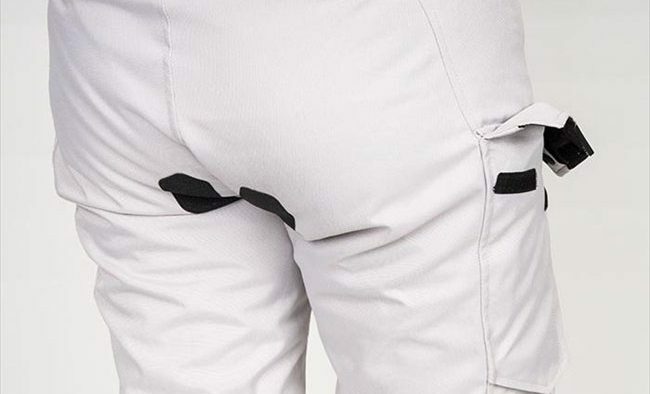 My take is that it may be reinforcement for the pants-to-jacket connection. Looking at the underside of the seat on the pants, REV’IT! has placed two small “gripper” strips to help you stay planted. I like this feature, as the seat on my R1100R is very smooth and textile pants can cause me to slide around pretty easily. The strips on the Enterprise 2 pants do provide noticeable grip and still are small enough to not impede intentional movement on the seat. The main shell of the Enterprise 2 pants uses a 600 denier polyester textile. This is a medium weight material offering a good balance between durability and thickness. It is stiff when new and tends to crackle and crunch a bit when walking around until it breaks in, but it does “loosen” up a bit and is a little less noisy after several wearing…or it could be I’m just getting used to it. Both the women’s and men’s version of the pants acted the same way here. The 600D material is augmented in the knee and shin areas with a 1600D “Oxford” polyester that provides additional abrasion resistance. The Oxford description refers to a basket-weave pattern which can be seen in the material when viewed up close — like Oxford shirts. The “D” or denier is a measure of the weight of a filament or strand of material. Silk, for instance, is one denier and that means it weighs 1 gram for 9000 meters (yes 9000) of a strand (Source: Wikipedia). Think about how much more mass a thread of 1600D must have and you can see why a higher “D” can be desirable for safety apparel. This 1600D material is black and easily stands out against the light color of the pants. On the black version of the pants this area is still black in color, so it doesn’t stand out or contrast against the shell like it does on the “silver” colored pants shown in our photos. Above the knees is a section of accordion-style stretch material, which is nice. As you always are bending your knees against the internal protectors, it makes sense to have a stretch panel in this spot. It’s good to see it used on these pants, especially since REV’IT! doesn’t even offer it on some of their more expensive pants choices. The outer shell of the Enterprise 2 pants is not waterproof like the original Enterprise pants. This new version uses a Hydratex waterproof liner to keep the water out. 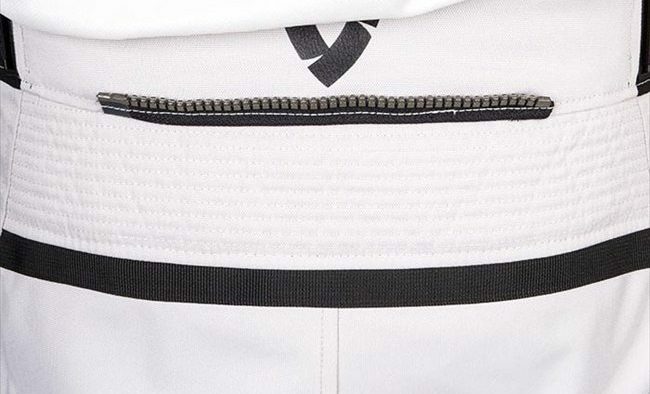 You can see this behind the main zipper in a gusset that helps keep this area waterproof. Since water could end up trapped between the outer shell and waterproof liner, the bottom edge of the liner is mesh where it attaches at the leg opening. Any water that might end up between the two layers will simply exit at the bottom of the leg through the mesh material. The 1600D material on the knee and shin area should provide good abrasion coverage if the unfortunate happens. Inside the leg in that area are pockets for the Knox Flexiform CE knee/shin protectors included with the pants. These are thick and rubber-like and made in sections to flex easily. 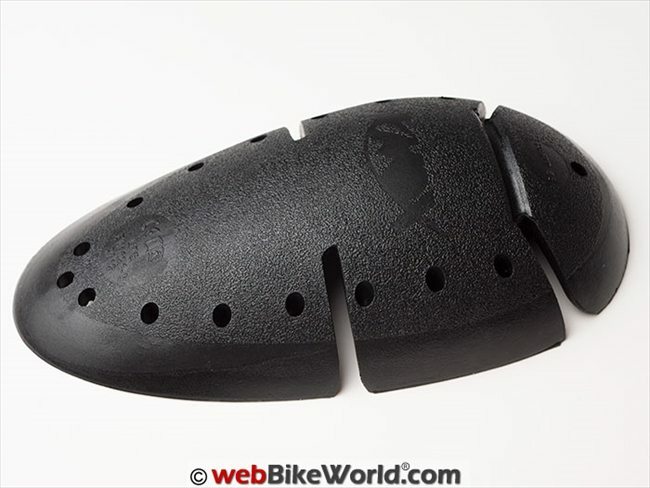 The knee protectors are sized differently for the men’s version of the Enterprise 2 pants, with the men’s protectors having noticeably larger pieces. I think this demonstrates that REV’IT! really takes time to account for differences between sexes when designing their gear even when the gear on the surface seems so similar, so these pants are not “Unisex”. 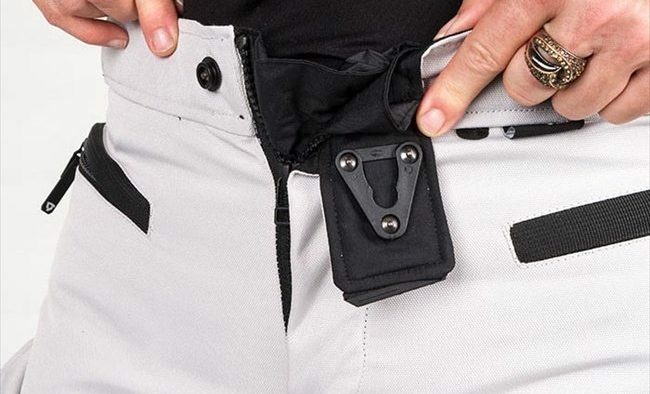 The knee protector pocket has sets of hook-and-loop fasteners that let you adjust the height. The pocket is part of the waterproof liner, so while it seems ruggedly made, I would make sure to handle this area gently as damaging it could affect the waterproofing. Hip protectors are also provided and these are a new type that I haven’t seen before, called SeeSmart. They are very thin and flexible. The SeeSmart protectors are also included in the REV’IT! 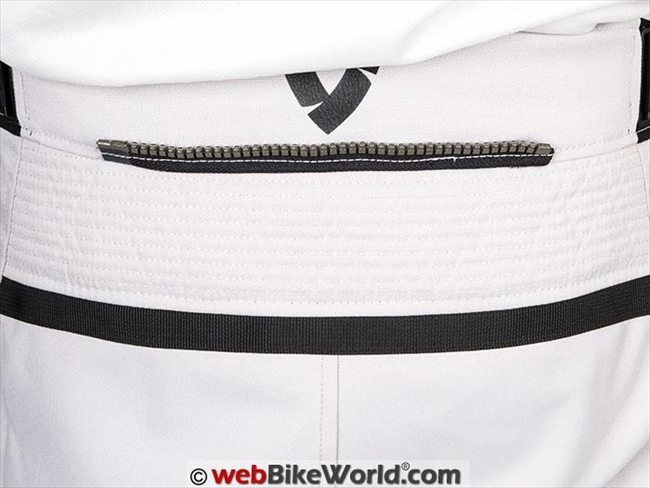 Airwave 2 pants review published not long ago on webBikeWorld and those summer mesh pants are also available in men’s and women’s versions. Even as thin and light as they are, the SeeSmart protectors still provide CE Level 1 protection. The material is based on the same type used in the SeeFlex protectors with Level 2 protection. The SeeSoft brand protectors are now owned by REV’IT! and the brand was described in the webBikeWorld REV’IT! 2013 Spring/Summer Clothing Preview and REV’IT! 2013 Fall/Winter Clothing Preview and others. The protectors in the knees and the hips are removable and replaceable so you can upgrade to higher CE 2 protectors like the SeeFlex type also. The description for the men’s version of the Enterprise 2 pants clearly states that the pants are designed to be worn over regular street clothes. The women’s version isn’t described this way and I’m not sure if that is on purpose or not. The fit isn’t snug for the size but I don’t think you could wear these as overpants without ordering one size larger. The men’s version does seem to have more room and Brandon can wear the size he would normally wear in jeans, with enough room to fit over street pants. He did say that they fit closer than other textile pants he owns from other manufacturers; a good thing as it helps keep the knee protectors in place in case of a crash. Both women’s and men’s editions have waist adjusters on each side. The men get an adjuster that maxes out at eight inches (20.3 cm) and shrinks down to 5 inches (12.75 cm), while the woman’s version loses an inch (24 mm) in length for comparison. I will also point out that the material used in the shell makes the last two inches (48 mm) of adjustment redundant, as the waist doesn’t stretch out that far. On the original Enterprise pants, there was a zipper that ran all the way down the inseam to make it easy to put them on while wearing boots. The Enterprise 2 version has a zippered gusset that runs from the leg opening to the knee, which does make it easier to put on boots and fasten them but you’re not going to get these pants on over riding boots. Once the pants legs are zipped up, the leg opening can be adjusted to fit closely around boots. 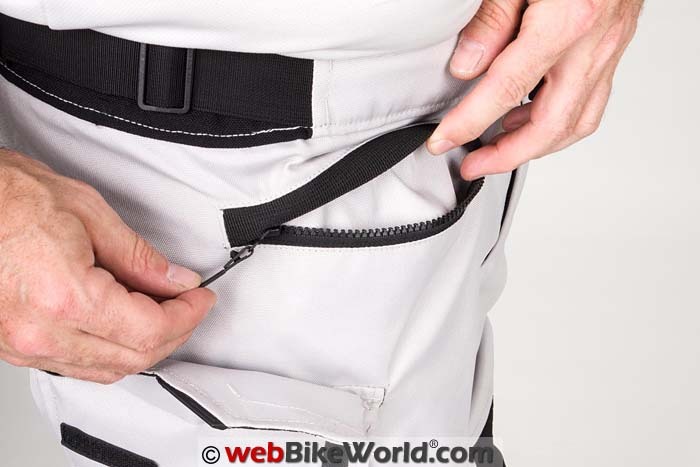 There is tab at the bottom of the leg that connects to a long strip of hook-and-loop fastener that can be used to cinch up the opening for a snug fit. This can help prevent water and cold air from getting up the pants leg. 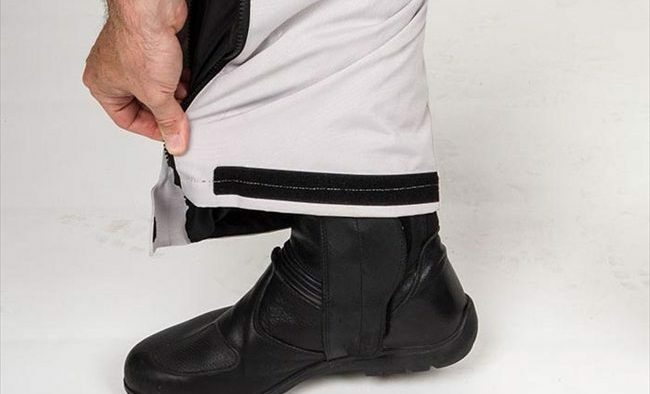 I’ve been thinking about why this change was made and maybe this design is to remove the chance of snagging the interior lining on a boot or shoe? Snagging could damage it and would compromise the waterproofing. The waterproof liner is supposed to be breathable and it is, but the term is often misunderstood. “Breathability” can get confusing as it sounds like it would be a measure of airflow, when it refers to water vapor transmission. REV’IT! actually publishes this figure for the Hydratex liner, which is 5000g/m2 over 24 hours. I admit I didn’t know exactly what that figure means so Brandon and I did some research. The published numbers from REV’IT! show that the Hydratex liner can pass through up to 5000 grams (5 kg) of water vapor across a square meter of material over a 24 hour period. This measurement is pretty standard across most mid-range waterproof/breathable materials with just a few high end products reaching as high as 15 to 20,000 grams. The point is that these pants will keep you dry in the rain. However, when the temperatures start to rise above 75-80 F (24-26 C) the Enterprise 2 pants may become too warm for comfort. This usability or comfort range will be different, of course, for riders in different climates. But since the liner is non-removable, I think the Enterprise 2 pants are best suited for cool to mildly warm temperatures. The Enterprise 2 pants provide REV’IT! quality and features at a reasonable price. The fixed liner may limit the temperature range to cooler and/or wetter weather, but that’s by design. Some motorcyclists prefer to have dedicated gear specific to the seasons, where others may prefer something with an interchangeable liner. For example, the REV’IT! Airwave pants (review) are available in both men’s and women’s versions also and they are designed for warm weather. Or you can also find REV’IT! pants with multiple liners, which can then be adjusted for different climates. The price point of the Enterprise 2 pants is actually comparable to some inexpensive brands of textile pants but the construction and build quality of the Enterprise 2 pants are very high. REV’IT! also includes innovations like the slide-snap at the waist and the super slim SeeSmart CE hip armor that add value. 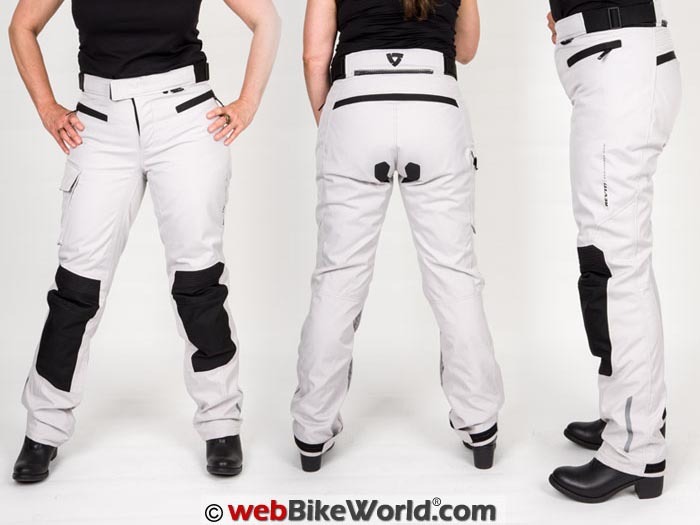 The Enterprise 2 pants also offer protection and visibility and that is the name of the game when riding. Notes: Short and Tall lengths available also.